The largest-selling latest edition of the Bhagavad-gita in English, is knowledge of 5 basic truths and the relationship of each truth to the other: These five truths are Krishna, or God, the individual soul, the material world, action in this world, and time. In translating the Gita, A. C. Bhaktivedanta Swami Prabhupada has remained loyal to the intended meaning of Krishna's words, and has unlocked all the secrets of the ancient knowledge of the Gita and placed them before us as an exciting opportunity for self-improvement and spiritual fulfillment. 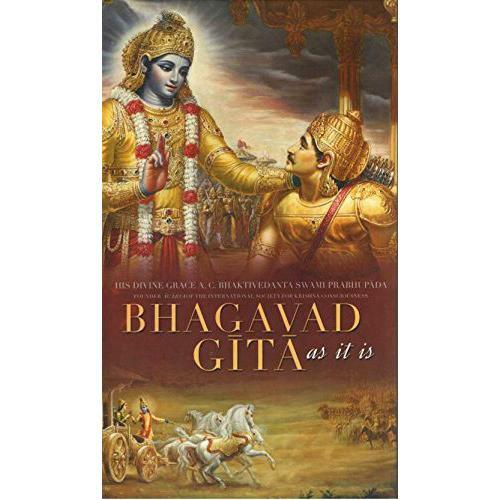 The Gita is a conversation between Krishna and His dear friend Arjuna. At the last moment before entering a battle between brothers and friends, the great warrior Arjuna begins to wonder: Why should he fight? What is the meaning of his life? Where is he going after death? In response, Krishna brings His friend from perplexity to spiritual enlightenment, and each one of us is invited to walk the same path. About A. C. Bhaktivedanta Swami Prabhupada Abhay Charanaravinda Bhaktivedanta Swami Prabhupada was a Gaudiya Vaishnava guru and the founder-acharya of the Hare Krishna Movement. His mission has reached the entire world and his teachings are followed by millions of people. He is also the founder of the International Society For Krishna Consciousness (ISKCON). His publications include an unabridged translation of the Srimad Bhagavatham in, the 18 cantos, the Isopanishad and a shorter version of the Bhagavad Gita.